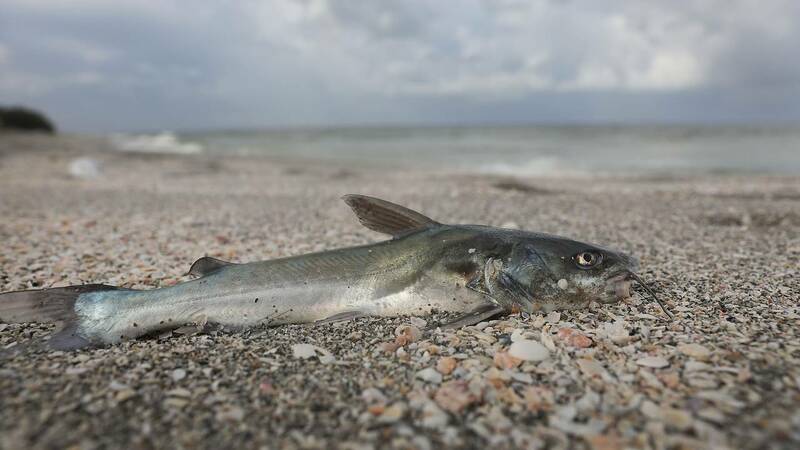 A fish is seen washed ashore after dying in a red tide in Captiva, Florida. (CNN) - A marathon algae bloom that has already killed thousands of marine animals in Florida is now causing health problems for humans. Respiratory irritation has been reported by people in six counties along Florida's southwestern coast, said the Florida Fish and Wildlife Conservation Commission. Algae blooms usually happen in the late summer or early fall and last around three to five months. But this current algae bloom -- also known as a red tide -- started in October and has stretched for more than nine months. The phenomenon is clogging inlets and canals. On some beaches, it's impossible to walk without tiptoeing around the carcasses of marine life. Conditions are so bad that the governor called an emergency order. The bloom has killed fish, sea turtles, sea birds, a shark and multiple manatees. Florida and Texas deal with red tides each year, but this one's effects are unprecedented. It's been more than a decade since the Gulf of Mexico has had bloom that lasted this long, said Florida Department of Environmental Protection officials. About 100 miles of shoreline are affected by the red tide so far, and officials don't know much about when it's going to end. "It's hard to predict more than a few days out," said Michelle Kerr, a spokeswoman for the Florida Fish and Wildlife Conservation Commission. A red tide, also known as a harmful algae bloom, is a fast-growing colony of microscopic algae that often turns the water red. The group of sea and freshwater plants produce toxins that can hurt -- and sometimes kill -- marine life, birds and people. Red tides can also release toxins into the air that sometimes cause respiratory issues, eye irritation or asthma, the National Oceanic and Atmospheric Administration says. Most algal blooms aren't harmful. In fact, they're actually helpful as a major energy source in the ocean's food web. Red tides have been reported in all US coastal states, and it's possible they'll start happening more often, NOAA says. Because of their unpredictability, scientists are trying to figure out how to find and forecast where the blooms will form so people have time to prepare for a red tide and its effects. Red tides are measured in several ways: how long they last, the water's algae concentration and effects on wildlife are just a few, Kerr said. This harmful bloom has killed more and lasted longer than many have in the past. It's the longest one on record since 2006, Kerr said, the year after Hurricane Katrina rocked Florida. It's possible that Hurricane Irma had something to do with the latest red tide. When the hurricane hit the area in September, its heavy winds took nutrients and dropped them in coastal waters. Those nutrients are huge helpers in getting algae to grow, NASA says.